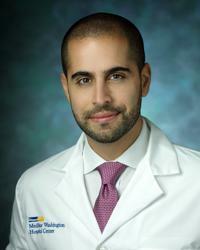 Dr. Ali Rahnama, DPM, is a fellowship-trained foot and ankle surgeon affiliated with MedStar Washington Hospital Center and MedStar Georgetown University Hospital, and is an Assistant Professor at the Georgetown University School of Medicine. Dr. Rahnama sees patients for all conditions of the foot and ankle, with a special focus on reconstructive surgery as well as minimally invasive and arthroscopic surgery for the treatment of athletic injuries, which include ligamentous and tendon injuries as well as fractures of the ankle, talus, calcaneus, and Lisfranc joint. Dr. Rahnama also treats and specializes in diabetic Charcot reconstruction of the lower extremity. He is certified in the STAR Total Ankle Replacement System, the Cadence Total Ankle Replacement System, and the Wright Infinity Total Ankle Replacement System and has completed the American College of Foot and Ankle Surgeons (ACFAS) Foot and Ankle Arthroscopy course. Dr. Rahnama’s clinical interests include sports-related injuries, fracture management, Charcot reconstruction, bunion and hammertoe correction, and first metatarsal phalangeal joint arthritis. His research interests include elective surgery in the diabetic population and exploring novel techniques for hallux valgus (bunion) surgery. He is dedicated to utilizing techniques that allow patients to get back on their feet as soon as possible without compromising care. Dr. Rahnama completed his medical schooling at Temple University School of Podiatric Medicine before completing a three-year surgical residency in foot and ankle surgery at the Wayne State University/Detroit Medical Center and the Children’s Hospital of Michigan. He then completed a one-year specialty fellowship in traumatic and reconstructive foot and ankle surgery with Kaiser - The Southeast Permanente Medical Group, Inc. in Atlanta, where he performed more than 1,000 surgical procedures. Dr. Rahnama lives locally with his wife, who is undergoing her medical training in Washington, DC. They enjoy outdoor activities as well as trying new and different foods when they can.